A couple days ago I was over at No Minister and read Fairfacts Media's post on Gorbal Warming. Seeing the sat shot reminded me of the big dump of Global Warming we had in 2006. In fact I think the sat photo I lifted from Fairfacts is of said dump. Two severe winter snowstorms accompanied by bitterly cold conditions, and later heavy frost contributed to a particularly cold June. The national average temperature of 7.3 °C was 1.2 °C below the 1971-2000 normal. This was the coldest June since 1972 which recorded 6.7 °C. The regions with the largest anomalies, more than 2.0 °C below average, were Waikato, King Country, inland Marlborough, South Canterbury, and North Otago. Parts of South Canterbury and North Otago recorded their lowest June mean temperatures in more than 50 years of record. One snowstorm hit Canterbury over 11-12 June, producing snow depths of 15 – 90 cm. 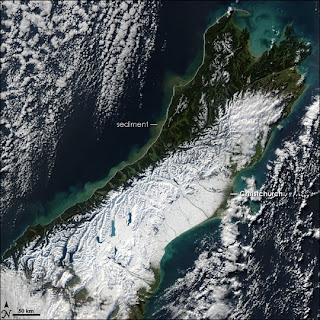 The other affected the central North Island over 20-22 June. These were accompanied by bitterly cold conditions, and later heavy frost. There were more days than average in June with air frost over much of New Zealand, especially in the central North Island and the southeast of the South Island. Precipitation was about 200 percent (twice) of normal in South Canterbury. In contrast, June rainfall totals were 50 percent (half) or less of normal in much of Bay of Plenty. June was much sunnier than normal in all western and southern regions, with record high June totals in Northland, Auckland, and Waikato, and coastal Otago. Anticyclones ('highs') were much more frequent than average for June in the Australian Bight with ridges of high pressure extending into the south Tasman Sea. This pattern resulted in frequent cold southerly winds over New Zealand. It was bad enough here where we had no power, water or phone for about two weeks, but it was far worse down in South Canterbury where the severe frosts prevented the snow from melting for 8 or 9 weeks. For all that time there were dozens of farms without power because of the exceptional number of power poles that were brought down by the snow. I think Mitre 10 and Bunnings had a boom in selling portable generators! We were lucky in that we didn't have the severe frosts here and our snow melted in about a week. The down-side was that the hillsides were so wet I had to use the wee dozer and trailer to feed the deer for three weeks. HELP! How do you change the publish date on a post that has been saved in 'Draft's for a few days? Posted this on the 20th. I read a lot of blogs and thought I'd have a go myself. I have no idea what I have to say so I'll just cruise along in a random fashion and see what develops, if anything. NOTE: Be sure to click on 'Older Posts' at the bottom of the page. If you feel like commenting, you have to click on 'Comments' at the bottom of the posts. Just sayin! A Salute To Multiculturalism - Click And Educate Yourself. Fungus Up Close. - They're interesting to look at close up.